Note the 'SAN'. Suffixes such as this are normally used when TLG describes plastic types for elements that appear in both solid and transparent colors like 30413/15207. The description somewhat even matches the parts appearance, as it's a transparent material related to ABS. Usually transparent parts like this are made out of poly-carbonate (PC) so it seems a little odd to me. Has anybody else recognised this before and are there any confirmations for SAN being used in lego parts? Are there other parts with this suffix? Or did I miss something and 'SAN' has a different meaning (IT/database related or something)? Only available at the San Diego airport? Possibly @Istokg knows the answer to these questions? First of all, when you look at the plastics that TLG was using from 1958-today.... you notice some different colorations (right is the oldest, as Cellulose Acetate, newer versions continue to the left) with the switch from Cellulose Acetate to ABS plastic happening in the 1960s (different regions made the switch at different times). When those train windows were first introduced in 1980, other clear parts started being introduced in a sort of milky hazy clear color (middle 2x4 brick above). But I have several older train windows from that era, and they have a yellowed look, reminiscent of the earlier Cellulose Acetate clear parts, rather than a more opaque look as found in other pieces (such as 1x6x3 clear windscreens and 2x2x2 clear slopes) of the 1980s. One of the attributes of SAN clear parts is that they turn to a yellow hue. So this makes perfect sense that these parts are made of SAN. However, I don't have many old Train System windows, so I can't make a more thorough observation of this, but since regular trans-clear LEGO has evolved over the last 59 years. (since 1958)... I see no reason why those early train windows couldn't have been made of SAN plastic, and eventually evolved to another material at some point. If LDD obtained this info from TLG... then I would be curious to find out what all the other plastic parts are listed as in LDD, especially the trans-clear ones, and also the blue train track era 2x8 white sleeeper plates, which are definitely not ABS. Where does polycarbonate fit in the above progression? Only the rightmost one is Cellulose Acetate, ther remainder are Polycarbonate... plus some have other additives. The leftmost one is current LEGO. One of the things we were told whilst on a tour of the factory back in 2015, was that elements are made of different mixes of plastics, depending on what the element is. Of course, we all already know this to an extent - flower stems, leaves etc are obviously made of a more flexible plastic mix than classic bricks are. But apparently the mixes are much more subtle than that, with there being a lot of varying mixes, for use in varying elements. Mainly affecting the stiffness I think. I can't remember too much about the detail, but that was one thing that I found very interesting, and which stuck with me. 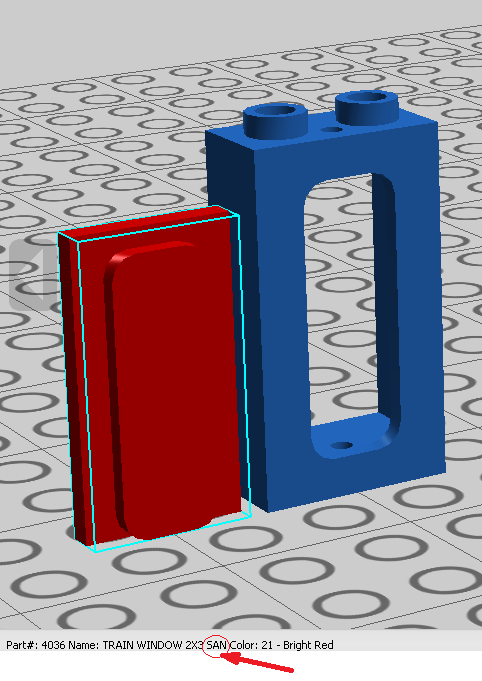 As a Lego product, LDD uses the official part names Lego uses, so yes, that information does come from Lego. I had never noticed this before, and it's the first material I've seen abbreviated on LDD other than PC and ABS, but that's not to say there aren't others. Unfortunately, those labels usually only appear on parts that have been molded in multiple materials, and in many of those cases only one of those is included in the program, so I suspect many parts that might have those sorts of designations in the part name may not be on LDD. Oh boy! Lots and lots and lots of detail whilst touring the factory. I don't think getting that opportunity again would ever get old. Bound to learn something new every visit. Sooooooooooo much to see, to be amazed by, to ask questions about. Definitely a highlight of a visit to LEGO in Billund. I'd love to see minifigs and packaging too but that's elsewhere of course. And those different mixes also put under different pressures in the molding machine too, depending on the element being produced.